In 2005, a CNN article called Related lobbyist Jude Barry one of five political consultants to watch and likened him to Karl Rove, the political strategist famous for his plan to achieve a permanent party majority in government by sowing division, systematic gerrymandering and framing the debate by planting messages in the news media. Barry has not achieved Rove’s national reach, but he has demonstrated similar ambition and expertise in Rove’s strategies. The Santa Clara equivalent of Rove’s permanent majority is City government dominance by Mayor Lisa Gillmor and her allies. Gillmor achieved a solid four-vote majority when Council Member Kathy Watanabe was appointed to fill the Council seat that opened after Gillmor was appointed Mayor. Vicious negative campaigning in the 2016 election solidified that majority and created enduring partisan acrimony that Gillmor has relentlessly manipulated for political advantage. With her four-vote block as the bulldozer, Gillmor transformed City Hall into a compliant operation to execute her political will and herself into an executive mayor in all but name. The Weekly has detailed much of Barry’s activity in local politics, including his ascendency in San José politics as staff aide to former Mayor Ron Gonzales and a member of Mayor Sam Liccardo’s “kitchen cabinet.” These roles showed Barry’s adeptness in the role of trusted advisor to city officials on a broad spectrum of matters. But in San José Barry is just one of many political players. Santa Clara has proven a better fit for Barry. So good a fit that some call him Santa Clara’s 8th Council Member. The picture emerges from many small details. Barry regularly meets with Santa Clara City Council Members, which wouldn’t be surprising except that many of those meetings do not pertain to Related’s City Place. Since the first public calendars were published in March 2016, Barry has had 15 meetings with current and former City officials unrelated to his client. They met again on March 25, 2017 when Barry took part in a “Tri-Village visioning dinner” to discuss the Winchester/Stevens Creek Boulevard area. The meeting also included Hosam Haggag, Kirk Vartan and representatives from the CORE Companies, among others. Vice Mayor Kathy Watanabe notched her first meeting unrelated to Related with Barry just last month when the pair had lunch to discuss “transportation issues,” a topic frequently listed on Council Calendars. Council Member Pat Kolstad also had a meeting with the lobbyist. The lunch, listed as “social” with “no City discussion” occurred on Mar. 31, 2017. The Weekly has verified from multiple commissioners, who spoke on the condition of anonymity, that Barry tried to meet with them privately. Lobbyist laws do not apply to Commissioners and their calendars are not required to be public. Barry’s most strikingly unusual involvement in Santa Clara’s public business goes beyond conversations with Council Members. City records show that Barry was hired in 2017 by City sub-contractor Tulchin Research to devise convincing campaign statements for a ballot measure intended to get voter approval for hundreds of millions in bonds for a new aquatics and community center. Later that year, Barry appeared on the timesheet of Peter Hillan, a City PR consultant, discussing Gillmor’s then-upcoming interview with the San Francisco Chronicle editorial board about a confidential Stadium Authority performance audit report. Barry’s relationship with Gillmor goes back at least to 2010 when the two worked on the Measure J campaign to build Levi’s Stadium, which Gillmor spearheaded. In 2016, Barry and Gillmor arrived together at a Christmas party at O’Neill’s that Davis and Watanabe also attended. This social event was not reported on any calendar, despite the Council’s stated desire for transparency. After Barry surfaced in Santa Clara, so did his subscription software businesses, former clients, and business and political partners and their political methods. In 2016 the Santa Clara Police Officers Association PAC ran a money funneling operation that channeled money from developers into independent expenditures for Gillmor’s slate of candidates. This was the same tactic used in Magdalena Carrasco’s 2014 San José City Council campaign, run by Barry’s political and business partner John Shallman. In that campaign $100,000 in “gray money” — partly from a developer front organization, the Neighborhood Empowerment Committee — was funneled through the Fraternal Order of Police PAC for independent expenditures. Shallman is a lobbyist, and Barry a former lobbyist, for the California Apartment Association, whose PAC donated $10,000 to the 2016 Santa Clara POA PAC’s independent expenditure operation — more than it ever donated in a Santa Clara election. Shallman himself was never employed in Santa Clara. But Barry’s longtime business political associate Stephen Churchwell was and still is. Churchwell was hired to defend the City in the recent California Voting Rights (CVRA) lawsuit. He was hired despite having no experience litigating a CVRA case and when the City already had an experienced CVRA litigator on contract. Churchwell is also directing the City’s appeal of the unfavorable decision. In May 2017 the Silicon Valley Organization, or SVO, (formerly the Silicon Valley Chamber of Commerce) began meeting with Santa Clara public officials. In 2012 Barry ran a charter schools PAC with former SVO executive and former San José employee Jay Rosenthal to run a negative campaign against County Board of Education Trustee Anna Song. Barry was also a lobbyist for SVO in 2015. Barry operates four online election-related businesses — AllPoint Pen, VeraFirma, VoterPros, VocLoca — which first appeared in Santa Clara in 2016. That year police chief candidate Patrick Nikolai paid $10,000 for Barry’s VoterPros campaign-in-a-box service. Reportedly, Barry also tried to sell the service to other candidates but they weren’t buying. In 2016 Davis and Silva’s campaign websites used a service that solicited cell phone numbers for opt-in text message updates. In January 2018 Barry’s robo-text service VoxLoca made its public debut, and was used in June by the police union PAC for a push poll on June’s Measure A — an unreported expenditure to date. Barry is an old hand at using the press to promote his clients and denigrate opponents. 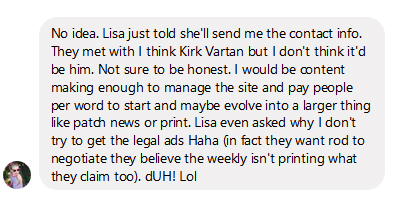 But political consultants are starting to skip the middleman and run their own “news” operations. Fake news has been seen before in Santa Clara. Fast forward 14 years: In 2016 Barry became a trusted advisor for the contemporary digital equivalent of the Mission City News. Despite Haugh’s stated intention of increasing transparency in the Mission City, he failed to make the most important disclosure of all: that Mayor Gillmor and Council Member O’Neill were behind starting the blog — something that would explain Haugh’s consistently flattering coverage of the Mayor and her slate during the 2016 election. Messages in the Weekly’s possession portray Gillmor and O’Neill as actively interested in helping Haugh to start his blog — including finding financing for it — and show Barry in the role of a confidant and an advisor. In a meeting not reported on Gillmor’s or O’Neill’s calendar, Haugh had lunch with the duo on Sept. 1, 2016. The meeting discussed “news in Santa Clara and ideas on how there could be another news medium there digital based [sic],” according to messages obtained by the Weekly. In these messages Haugh says, while Gillmor couldn’t directly finance the operation because of Council, “she’ll send me the contact info.” Gillmor provided Barry’s name as someone who could find the funding to start a newspaper. The two had conversations, according to the messages the Weekly has seen. They discussed the ins and outs of news and strategized on how a news outlet would be possible. In several messages, Barry’s interest was confirmed. In these messages Haugh claims Barry does not direct anything Haugh publishes, but that the lobbyist has “given some good tips.” Reporters from other Bay Area news outlets have privately described turning down Barry’s attempts at story placement only to see his pitch in Haugh’s blog soon after. Since the blog began, the City appears to have allied itself with Haugh; giving him privileged City Hall access via unnamed “sources,” trying to interfere with real news organizations’ ability to report on City Hall, and discrediting news sources that don’t follow the Gillmor party line. Haugh, for his part, regularly bashes local newspapers and reporters. After Barry’s arrival, City 2016 elections reverted to the toxic negative campaigning that the City’s campaign ethics programs were supposed to eliminate. That campaign established a new low. Previous elections have been heated, but no one running for police chief has ever, to anyone’s knowledge, suggested that his opponent was a dirty cop. In 2016 the police union PAC funded hit pieces suggesting that the incumbent police chief was dishonest — amplified by Gillmor’s battle cry of “rot and stink” that would be cleaned up by her candidate, Nikolai. Local attorney, and 2012 Council candidate, John Mlnarik set out to prove Barry was the mastermind behind the campaigns of Debi Davis, O’Neill, Watanabe, Tino Silva and the shadowy political group Stand Up for Santa Clara, filing FPPC complaints against all of them. “Yet there is no report of Davis paying for Barry’s services on Davis’ Form 460. If Barry is not being paid for his consulting services, an in-kind contribution from Related Companies would be required as Barry is being paid to act as a political operative in Santa Clara. Likewise, Mlnarik said Barry conducted Silva’s, Watanabe’s and O’Neill’s campaigns, noting that Silva spoke in favor of the Related development at a June 2016 City Council meeting. In October 2016, Silva received $3,000 in donations from individual Related executives in New York and Southern California. Stand Up for Santa is a Clara pro-Gillmor and anti-stadium agitprop website started and run by Santa Clara Youth League (SCYSL) officials and employees Silva, Steve Robertson and Gabe Foo, according to their own public statements. The site does not identify itself as a business, political or non-profit entity. The FPPC dismissed Mlnarik’s complaint, saying that there was “insufficient evidence.” But the FPPC fined Davis, Silva and Watanabe for filing financial reports late (Jan. 2017) showing $4,000 expenditures in July 2016 for political consulting from Foo Robertson Consulting, incorporated Dec. 29, 2016 — after the election — and whose principal is SCYSL president Gabe Foo. Foo Robertson Marketing has no Santa Clara business license and no website. But it does have one important client: Mayor Gillmor, according to her September 2018 campaign filing. Perhaps Barry is simply at the right place at the right time to find his name attached to so much that is happening in Santa Clara. A mountain of coincidences could be just that, except for a Silva 2016 post-election party photo in the Weekly’s possession, along with a chain of email messages beginning with the party invitation. “Thank you,” Davis replied to the invitation from Silva, the party was “on my calendar,” and she told Silva the party was his 2018 campaign “kickoff” — something that was derailed by the Superior Court’s order that Santa Clara must elect its Council from six single-member districts and the court’s ruling about election sequencing. 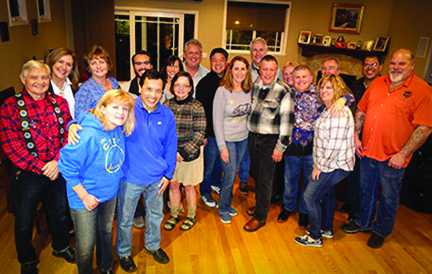 Barry posed for a party photograph with Silva’s campaign committee. The image was distributed to the guest list — which included Gillmor, O’Neill, Watanabe and Davis as well as the soccer league’s Foo and Field, and Charter Review Committee Members and Measure A advocates Hassam Haggag, Beverly Silva and Saskia Feain. Describing it as an “awesome group,” Foo asked recipients not to post the photo on social media. It is said every picture tells a story. The story this picture suggests is about a lobbyist who has inserted himself deeply into Santa Clara City Hall to the point of being an all-but-in-name council member, supporting an all-but-in-name executive mayor. Referring back to the example of Karl Rove, some might even be prompted to call the Gillmor administration the Barry administration. * Stampolis was indicted for failing to report this as a campaign mailer, but a judge dismissed it with the logic that newspapers can go out of business after one or two issues. **Although Barry wrote frequently on San José Inside, the Weekly found no evidence that he was among its founders. I had never heard of Jude Barry until I read about him in the Weekly. I do know of Robert Haugh and his website. I stopped reading or commenting after I saw he was tracking ip addresses and anyone that disagreed with him got chastised or insulted by him or his cult following. Now it makes sense. Interesting so many familiar names and how they are all tied together and conspiring to influence we, the public. I would add that San Jose resident and council mainstay Kirk Vartan is the 9th councilmember with close ties to O’Neill due to BAREC. More than once she’s in the thick of it. Time for her to shed her saintly Sunday school teacher image.